Hello. I'm very happy that this new series is starting. As soon as possible, please tell me Usagi's birthday, blood type, and star sign. My birthday is June 30, my star sign is Cancer, and my blood type is O. I wonder if anyone's the same as me. I'm going to be a junior high school student in April. Although I'll have a sailor suit, I won't be able to become Sailor Moon. But, like Sailor Moon, I'm going to be kind and supportive. I think I'll get a black cat in junior high school. What do you think I should name her? I'd be so happy if you named her Luna like me. Even if you become a junior high school student, please keeping cheering for Sailor Moon. 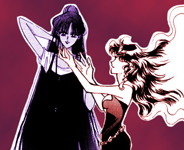 What's the relationship between Sailor Moon and Sailor V? Tell me. This is Naoko Takeuchi. 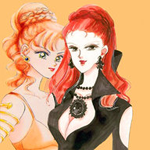 Sailor Moon and Sailor V's relationship is a secret. V is a big success over in "RUNRUN," so please don't miss out on her activities! Hello. Congratulations on the anime. Are Sailor Moon goods going on sale? I hope you come up with something like a transformation set. Congratulations on making a TV anime. I can't wait to see you in action, Usagi. Who's your voice actor? All the responses I've gotten about the anime have made me so happy. Thank you everyone. The Sailor Moon goods will be a special illustration, and all the voice actor information is listed at the top of this page. Usagi, it was so cool when you disguised yourself as a woman doctor in last month's issue. Next time, please don't just try on a disguise, try to challenge yourself by doing the job, too. Just by being Sailor Moon, Usagi already makes me feel a bit ill. I have a question for Miss Takeuchi. Usagi likes rubies and pearls, but what kind of jewelry do you like? I like anything golden. Someday, I want to have a room full of golden things. The anime was really funny. My younger sister and I recorded it and watched the videotape eight times the next day. The TV anime was cool. The transformation scenes and the opening theme were super awesome. The anime has finally started. Thank you so much for sending in fan letters so quickly. Please keep letting us know what you think. I'll be waiting. My grandma's cat has big and cute eyes like Luna, so I named her Luna. My grandma likes the name, too. Wow! Thank you for naming her after me. Everyone, please be sweet to your pets. Warm regards. Out of the three soldiers, who is most similar in personality to Miss Takeuchi? Usagi is bad at English, but how about Miss Takeuchi? My personality is closest to Usagi's, but my English is much better. I have a question for Usagi. Usagi, whom do you like more, Tuxedo Mask or the guy from the arcade? Well, uh, that's a tough question. I feel torn. Why don't you read this month's issue and judge for yourself. Best wishes. We took a survey in my class, and half of the kids want to be Sailor Moon in the future. What's more, I found out there are quite a few boys in my class who love Sailor Moon. Usagi is very popular. Really? I'm surprised there are so many people who want to be Sailor Moon. Being a champion of justice is tough, so everyone must be more serious than Usagi. Miss Takeuchi, I think that Usagi's enemies, the Four Cardinal Guardians, are the type of boys you really like. Am I right? Heh. Heheheh. How did you know? You have a sharp eye. Which of the four do you like? I don't know whether or not to believe this, but please listen. Recently, my pal was riding the T Bus, and it seems that Mamoru Chiba and Usagi were on board. Should I believe my friend? Oh, but I always ride that bus with him. I wonder if we were spotted. Just kidding! Hello. I'm always looking forward to the manga and anime. If you have any, please tell us lots of information about the anime. I have some fantastic news. Next month's furoku will be the "Sailor Moon Anime Exciting Newspaper" full of info about the anime. It will be in full color, and four times the size of Nakayoshi. Wait for it on pins and needles. Miss Takeuchi. Kotono Mitsuishi, who does the voice for Usagi, is even cuter than Usagi is, but are you more beautiful? No way, no way, not at all. Miss Mitsuishi and I are the same age. How surprising! Happy birthday, Usagi! From now on, work hard not to cause Luna worry. Thank you. My birthday was on June 30. From now on, I'll try harder to do my best. Luna, please listen. It seems there's a cute shop called "Usagi Tsukino" in Sapporo. Really? I wonder what kind of store it is. Please let me know if any of you find out. My whole class is putting on a Sailor Moon play soon. We're all gonna do our best, so Usagi, be reliable, too. 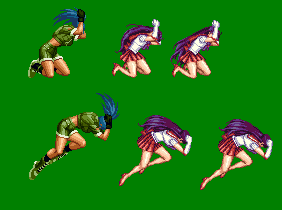 Miss Takeuchi, we're all playing Sailor Moon now. The boys are playing, too. I'm Ami. Wow, that sounds like fun! But remember to take care and be careful so you don't get hurt. NAOKO says please. Yep. That's Naoko for you. From the very beginning of her career she didn't beat around the bush and stated it clearly and loudly what she values and works for. And this is not drawing manga. Does that mean PQ Angels ain't worth gold? I always thought was the character Naoko based on herself? Also, in the deluxe issue of Nakayoshi now on sale, I've included some three-panel comic strips, so please don't miss out on them. Have we ever seen those comic strips? Pretty sure they're the ones in the first art book. As Usagi's family members are wholly based on Takeuchi's family IRL, Usagi is also supposed to be the embodiment of Takeuchi herself. Usagi, listen. I've been told my voice sounds like Queen Beryl's. Eh!? Even if you have a voice like Beryl's, I love you for supporting me, so don't worry. Mako and I have the same birthday, December 5th. Please wish her a happy birthday for me. Okay, roger that! Speaking of which, in the November issue, I made a mistake about Mako's star sign. In reality, she's a Sagittarius. Miss Takeuchi. 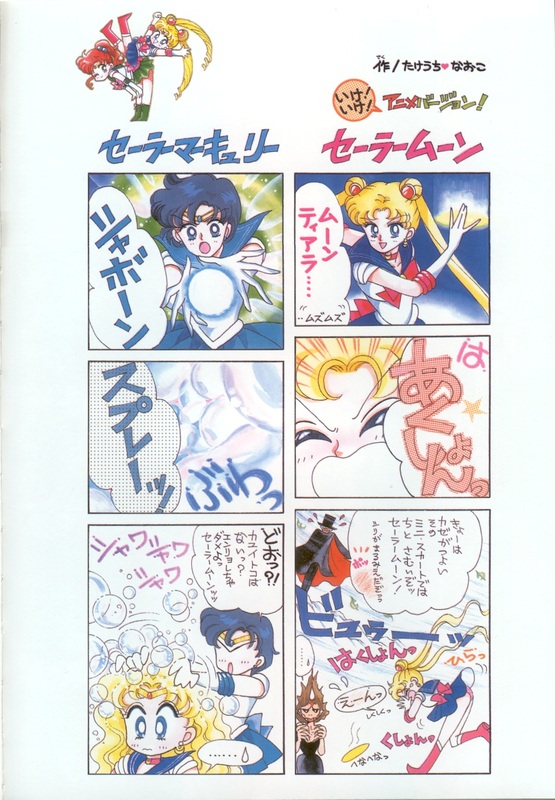 I read the three-panel comics in Nakayoshi Deluxe. The one with Sailor Jupiter was interesting. Miss Takeuchi, I entered for the December issue prize giveaway. I hope I get the jewels and necklace. Please enter, thank you. I'm looking forward to seeing everyone's entries for February and March. Also, please send in postcards for the popularity poll. You can vote for your top three. I got the "Sailor Moon" Gameboy game as a New Year's gift. I can't wait to play it. I got the "Sailor Moon" calendar. I like it a lot and put it up in my room right away. Everyone, thank you for getting everything. Tell me what your favorite Sailor Moon goods are. For the January issue popularity poll, I voted for Rei. She has a beautiful heart, and I like her, I really like her. Thank you. The votes are being tallied at this very moment. Serenity, Sailor Venus, and Sailor Moon are in the lead. Miss Takeuchi, congratulations on "Sailor Moon's" one year anniversary. Good luck with your future. Thank you. Everyone, thanks for your support. I will do my best in the future. Usagi, I put the February issue furoku poster up over my desk. Now I'm happy and motivated. Thank you. I'm glad you like it. 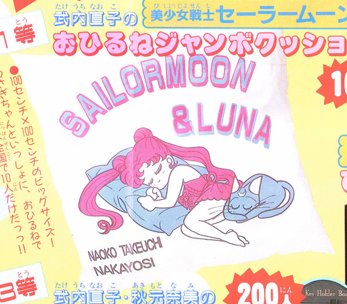 Another Sailor Moon poster will be included with next month's issue. Please don't miss out on it! Hello, Luna. I really liked the giveaway prize cushion I got. Dear Luna. By any chance are you and Artemis in love with each other? You are, right? Well, er, um, the thing about that is... Look forward to a future story. 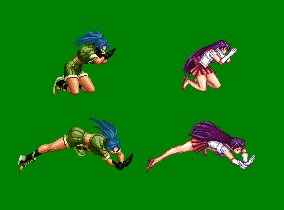 Upon finalizing "Sailor Moon," she created "PQ Angels." It was a "complete disaster," according to Wikipedia, and to make matters worse, Kodansha lost the manuscripts that she had completed. She then created "Love Witch," which was discontinued after only 3 chapters. In 2006, she created "Toki Meca," and "Toki Meca" was actually the only series she completed after "Sailor Moon" and "Sailor V."
Usagi. The action in the March issue was awesome. I was really moved by it. From now on, do your best, okay? Thank you. I don't have a lot of confidence, but all my friends and I will continue to do our best. Rei, your hair is so long. You seem really mature. I'm happy. But lately, due to the influence of Usagi and the other girls, I must admit my personality has changed. Darn it. I got the fan club items for February and March. I like them. It was nice, right? This month's item is my pen case. Send away for it, too! I have a question for Venus. Since I started buying "Nakayoshi" in March, I don't know your birthday. Please tell me!! My birthday is October 22. For other details like that, you can always consult the official fan book, which is this month's furoku! Miss Takeuchi, it's your birthday soon, right? Happy birthday. Good luck and do your best in the future. Thank you. My birthday is March 15. He. Also, the third volume of the manga will be released on April 6. As a special treat for the first edition, there's a full-color pin-up. Everyone, from the bottom of my heart, I appreciate your love and support. Is there an English translation of those anywhere? If you just go sailormusic.net, they have all the art books scanned with translations for each page. That place has the translations of Naoko's linear notes but not the actual comics. My bad; I misunderstood what you meant. I think someone translated them somewhere, but I can't seem to find a translation at the moment. Usagi, I bought all of the Sailor Moon tankoban and anime books. Good luck in the future. Thank you. The Anime Album: Volume I, full of information about the anime, just got released. There's a section in it called the Sailor Moon Cheer Squad where we included lots of the fan letters and illustrations the stations received. And don't forget. Volume II is scheduled to be released soon, so please go out and get it!! Dear Ami. What's your favorite subject? Mine is Japanese. I got the second highest score in my class on our kanji test. Wow, that's amazing! My favorite subject is math. In the future, I'd like to become a doctor. I have naturally curly hair, exactly the same as Mako's. Mako, how do you deal with people with big mouths? Pay them no mind, pay them no mind. Whenever something's troubling me, I say, "Guts! ", and all my worries go away. Thank you to Mayuko-chan and everyone who sent me a picture postcard of Sailor Moon at the thunderstorm festival. There will be BIG NEWS in next month's issue. Chibiusa is so CUTE!! I don't know if she's an enemy or an ally, but she's awfully CUTE!! Either way, I want some Chibiusa goods. Usagi's swimsuit in the May issue was really, really cute. I want a bathing suit like that. Wow, thanks! I'm happy for the compliment. Teehee. Ami, you don't always wear glasses, but sometimes you do. Are they just for show? Umm. I wear them when I'm reading or studying. Rei! Happy birthday! Good luck in the future. I'm cheering for you! Thank you. I'm being kept prisoner right now, but I'll do my best. I'm still so short. I wonder if I can grow up to be tall like Mako. You'll be fine. If you eat well and get lots of exercise, you're sure to get bigger. I won all the Sailor Soldiers from a toru toru catcher! Hey, don't forget! In June, the "Miss Rain" tankoban will be released. Please be sure and read it. During our science lesson, I told my teacher the names of Mercury, Venus, Mars, Jupiter, and the Moon in English. Thanks to Sailor Moon, I was complimented. Ami, I love reading, but there those who say people who love reading are gloomy. I love reading, too. I'm not gloomy. But, I have other interests, too. I'm good at swimming. What about you? My cousin Yuu is a big fan of Sailor Moon goods. Candy and sausages, 20 yen cards, 100 yen gachapon dolls, everyone's gathering up stuff for her! That's awesome! I also love to collect Sailor Moon goods. Of course, Venus is my favorite. Thanks for writing. NAOKO here. The fourth volume of the tankoban will be released next month. It's very good. Also, starting with the August issue of Nakayoshi, every month for the next six months, a Super Premium Card with a hologram will be attached to the supplement. A card file will also be attached to the August issue. Fan wishes Usagi a happy birthday. Picture Diary side story appeared in the July issue of RUNRUN. Fan congratulates Luna on being in the musical. Luna asks everyone to go watch the musical and says she hopes to appear in movies someday. Fan congratulates Naoko on winning an award. Naoko thanks everyone and says she hopes everyone will enjoy next month's giveaway item. Usagi. I was impressed by the July issue's cover. Usagi, you look great in your bathing suit. Thank you. Did you see this month's cover, too? It's an anime-like picture. Miss Takeuchi's original drawing was painted by Toei Animation's colorist. Please tell me what you think of it. The Super Premium cards that are coming out each month are wonderful. I'm gonna try to get them all. They're special cards, so please collect them. Be sure to subscribe to get the giveaways!